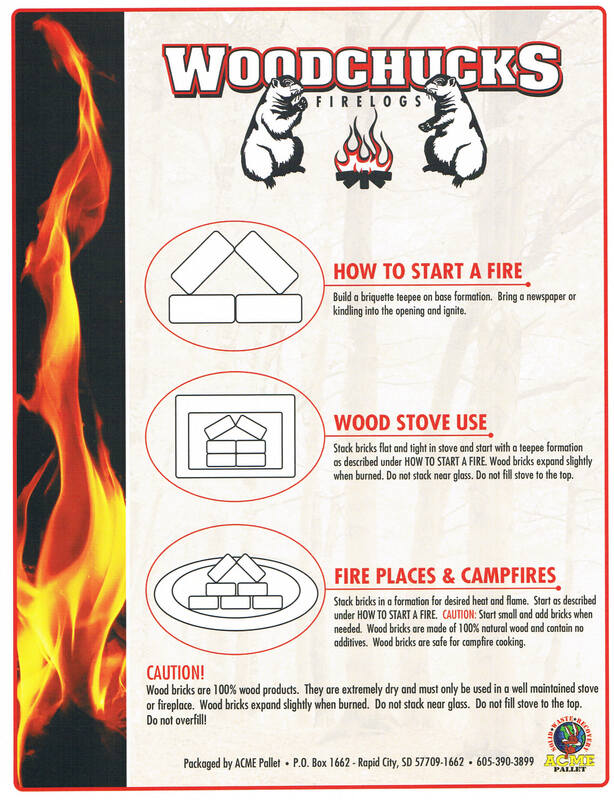 Woodchucks Firelogs are the Ultimate Firewood! You can even cook with them! Now sold locally in Rapid City! When compacted into a briquette, wood has burning characteristics similar to coal, but is friendlier to the environment.﻿ The briquetting process presses wood waste and compacts it to a minimum volume. Briquettes remain a natural product as they are formed under high pressure without fillers or artificial binders. The result is a high-quality briquette with uniform size, shape and hardness. Burning wood briquettes as fuel completes a natural cycle: on combustion, briquettes release only as much carbon dioxide as was naturally absorbed by the growing tree during photosynthesis. Instructions on how to start a fire found here. Or check out this video and see how it is done! Here is our NEW Promo video! Copyright 2016 Acme Pallet, Inc. All rights reserved.